We Mix Drinks LLC. 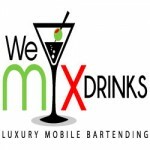 is D.C., Maryland and Virginia’s luxury mobile bartending service. We focus on providing five star bartending services for any occasion. We are the perfect solution to a wedding, bridal, bridal shower, rehearsal dinner, wedding, or reception!